Do you desire the breed standard flat face? Do you desire a lower nosed Persian kitten (commonly referred to as a "doll" face)? Is there a particular color you prefer? Some Persian kitten breeders breed for a doll face, some breeders for a flat face. The flat face is the breed standard and what all responsible Persian kitten breeders try to achieve in order to continue their line, preserve and better the breed, and to be competitive at cat shows. I have seen many websites for doll-faced Persian kittens where they claim "the doll faced Persian breed has less eye weepage and do not suffer from the breathing difficulties that are common in the flat faced Persian cat". This is NOT true. Many years ago, I believed this, and my very first Persian was a doll faced. Eventually, I owned 6-7 doll face Persian cats; some had more eye weepage than others, some had more difficulty breathing (smaller nares). Eye weepage and small nares is in the ENTIRE breed, not just the flat faced, Breed Standard Persian cats. 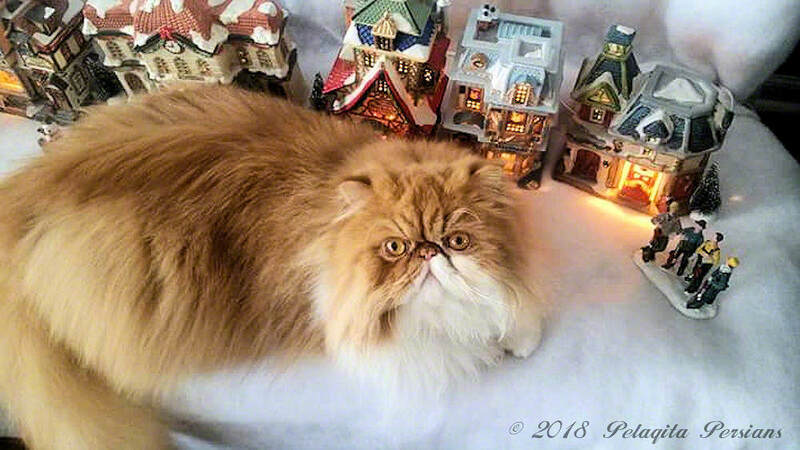 A particularly amusing claim I've seen on many different Persian cat websites is when a cattery says that the reason they do not compete in shows is because ringworm and other contagious diseases are "rampant" at cat shows. These are also the same catteries that are not breeding cats to the breed standard, but instead breeding doll faced kittens. Therefore, their cats could not compete at a show anyway as they do not meet the breed standard. Is there a possibility that a cat could pick up some contagious disease or ringworm at a cat show? Sure, just like we can pick up a cold anywhere and at any time just be virtue of being outside and interacting with other people. However, in almost 18 years of showing my cats and attending cat shows, I have NEVER had a cat pick up and bring home a disease. Personally, my suspicion is the catteries that say they do not attend cat shows and yet are breeding their cats, are using this as an excuse for not having show quality animals in their cattery. I will take it a step further, they are in the "business" of producing cats; breeding is not a hobby to them. Yes, there are some breeders that do not show their cats and can still be considered good and responsible breeders. However, they do not make excuses for not showing by blaming it on the show halls and contagious diseases. In my opinion, any responsible Persian cat breeder that has been breeding for some time will have had to deal with Ringworm at some point. So, beware of any cattery that claims they have NEVER had Ringworm. In my opinion, it just is not possible. Recently, a dear friend of mine contacted a Persian cat breeder and one of the questions they asked the breeder was "have you ever had ringworm or do you have it now?" The breeder denied having such a problem and when they got their new kitten, the kitten had ringworm. The breeder was immediately contacted and then she admitted that she had been sporadically treating the cats and kittens for Ringworm. There are safe and effective methods for treating ringworm and preventing it from spreading. Successful breeders isolate all new cats coming into the cattery so that a new cat cannot pass along any disease to the rest of the cattery. a stud cat that needs to be separate from others in order that he does not harm a young kitten just because it is a female. A breeding male does not care what age a female cat is, if it smells like a girl, he will try to breed her. I have seen quite a few websites claiming that each of their males have a spare bedroom along with his own "harem" of girls and the males participate in the rearing of their kittens. This is dangerous!!!! You do not put a breeding male in the same area as young, immature kittens. Breeders that do this are ignoring the basic instincts that drive an intact breeding male cat. Male cats are very physical with the females they are bred to. A stud cat can accidentally break a young kitten's back or even kill it. Stud cats HAVE to be put up for the safety of the rest of the cats and kittens in the cattery and to prevent unplanned or unwanted pregnancy. 3. Have the parents (or the ancestors of the parents) been DNA tested and can the breeder show you that the results are negative for the PKD1 gene (polycystic kidney disease)? Do the CFA registration numbers match on the DNA results and the CFA registration documents? 4. Are the kittens spay/neutered prior to going to their new homes or is that a fee you will incur afterwards? 5. Are the kittens microchipped? Microchipping is the only sure way that a lost pet can be identified and returned to its owner. If the kitten is not microchipped, this will be a cost you will incur after you take possession of the kitten. 6. How much food, etc. comes with the kitten? Is it a little baggie full (a couple days' worth of food) or is it a real commercial sized bag of food (2 pounds or more in weight)? 7. Do you get a pedigree for the kitten, pictures of the father and mother, the CFA registration paperwork, information about raising and caring for Persians? 8. If the breeder is local, do they allow a potential kitten buyer to visit their home and see not only the kitten they are interested in, but the other kittens, the parents, and any other breeding cats? In my opinion, if a breeder is worried about potential germs a kitten buyer could bring into the cattery, there are steps that can be taken to minimize the risk: take off shoes, spray shoes down with Lysol, wash hands with disinfecting soap, and other sanitary standards of care. (Vets' offices, doctors' offices, etc. have been doing this for years to prevent the spread of contagious issues). However, not allowing a kitten buyer to come to a breeder's home SHOULD NOT be a deal breaker. However, when adding up all the pluses and minuses for each breeder, I would count it as a minus for a breeder that does not allow visitors. There is a real safety issue that has nothing to do with fear of infectious disease and/or possible loss of life of kittens. There have been cases where a breeder allowed a potential kitten buyer or puppy buyer into their home and were later burglarized. All of the above questions should be considered when looking for your Persian kitten. Once you have determined the answers to the above questions, then compare those answers to each breeder. One breeder may be selling their kittens for under $500, but nothing comes with that kitten but the bare minimum (i.e., 6 month health guarantee, a baggie size bag of food, and you have to have the kitten spay/neutered within a certain date or you will not get the registration paperwork). Another breeder may charge more for a kitten, but the new owner receives several hundred dollars' worth of goods and services. So which cat is more expensive in the long run? That is a question each individual buyer has to answer for themselves. Do not be taken in by a great looking website that promises a lot, but may not be able to deliver on those promises. Do not be taken in by a website where the person is obviously skilled in written communication (that old adage "if it sounds too good to be true ..... it is"). Beware of breeders that claim they are cage free and then go on to say their cats are kept in spare bedrooms (they are still being caged). Compare apples to apples when looking at all the different breeder websites. Ask to be provided with documentation of PKD1 negative testing (even if it is several generations back as long as you see the mom and dad of your kitten in that pedigree so you know the parents, grandparents or great grandparents were tested). Ask for references. Check on-line if the name of the breeder or the name of the cattery has any "complaints" against them (but always remember there are a lot of untrue things on the internet, including bogus reviews). But above all, trust your instincts. If you feel at all funny about what you are being told or shown, walk away and find another breeder that makes you feel comfortable.